Straight-Cut 40 L Professional Touch Screen Shredder for small office use with continuous duty motor and heavy duty chain drive with steel gears. 3.8mm Strip Cut / DIN Security Level P-2 for non-sensitive internal documents. More Info. The KOBRA 245 TS S4 is a Touch Screen 3.8mm Strip Cut office shredder and features a fully integrated touch screen system where all the shredder functions are activated by simply touching the required command on the screen. The KOBRA 245 TS S4 model also features newly designed carbon hardened cutting knives, which allows for up to 40% more efficiency in the shredding capacity. The Touch Screen system with LED indicators show a host of operator friendly features including ENERGY SMART®; a power saving system to put the machine into stand-by mode after just 8 seconds and automatically disconnect from the mains power supply after being idle for 4 hours. If transparent material needs to be shredded then simply hold your finger down on the "Forward" button and the machine will continuously shred for 30 seconds. This shredder features an automatic reverse function in the event of a paper jam. 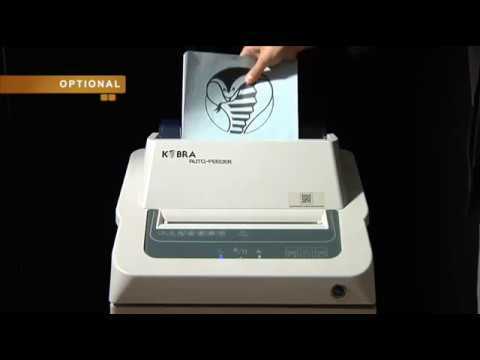 The KOBRA 245 TS S4 is unaffected by staples and metal clips and offers security level P-2, shredding up to 27 sheets of A4 Paper (70gm) per pass into 3.8mm strip cut pieces. The machine has 24 hour continuous duty motors, a heavy duty chain drive with steel gears and is 100% jam proof. The machine will automatically stop when the collection bag is full or the door is opened and will display a light to show which has occurred. The cabinet is also mounted on casters for ease of movement around the office. Please note that 2 High Security versions - Level 5 and 6 (245 TS HS and 245 TS HS-6) are also available for Government and Military type applications. See our High Security section for more details. An exclusive patented energy saving system where there is no electrical consumption after 8 seconds of non-use. The machine will also automatically shut-off after 4 hours of inactivity. Special motors can operate 24 hours a day non-stop without overheating, allowing for continuous shredding and maximum daily shredding load. Sturdy steel gears and a metal chain drive system offer superior reliability and resistance to wear in comparison with cheaper plastic chain drive systems. If too much paper is offered into the entry throat then the machine will automatically revervse to clear the jam. All controls are activated by simply touching the panel rather than pushing old fashioned buttons.